Inside: Here are 3 Holiday recipes for the best DIY sugar scrubs to make with your kids and grandkids. Unique ingredients, easy directions and loads of fun! 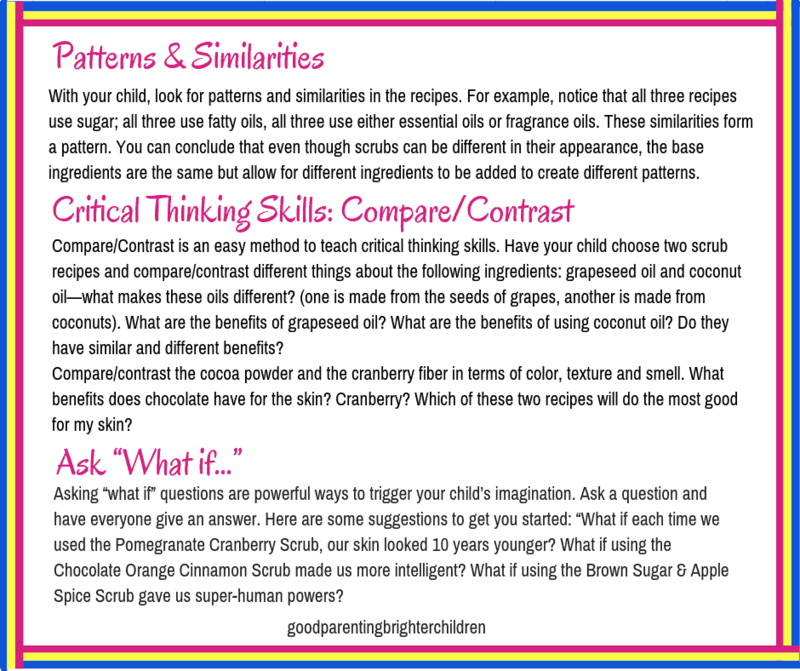 Discover tips on how these elements impact the skin and ways to teach your kids critical thinking skills as they create these fabulous sugar scrubs! Have you ever made a sugar scrub? They are amazing for your skin and will keep it glowing and healthy! Over the years I’ve concocted different natural skincare recipes for holiday gift-giving. Here are three super fun recipes for DIY sugar scrubs to make with your teens, tweens or grandkids. They are themed for Halloween, Thanksgiving or Christmas but you can make them year-round. Don’t just make these scrubs with your kids–turn it into a fun educational experience! Every activity you do with your kids should have some element of learning. As a result, they will equate learning with fun! I’ve included lots of information that will teach them how ingredients in our kitchen cupboards feed our skin. And, don’t hesitate to make these with your sons. The men’s grooming movement started in 2002. In a nutshell, men came to the realization that there is more to grooming than using a toothbrush. They are interested in having good skin. These scrubs will help your sons–include them in the process! Here are some fun facts, recipes, and more about scrubs. Scrubs are ingredients (sugar, oatmeal, cornmeal, salt, etc.) that when gently rubbed on the face or body remove or exfoliate the dead skin cells that have built up on your skin. You need to exfoliate because as the dead skin cells build up, they mix with bacteria and oil and clog the pores and create blackheads and breakouts. This dead skin buildup can also cause your complexion to look dull and blotchy and for girls, their makeup will not go on as smoothly. 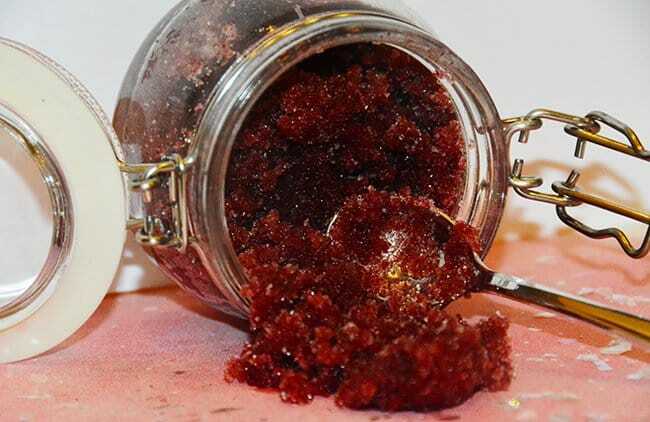 Sugar scrubs are amazing for the skin. The gently exfoliate without damaging the skin and depending on the ingredients you use, they have a wide range of skin benefits. Make your own–they are easy and can be less expensive than commercial scrubs. 2. How Often Do You Use Scrubs? When you are young, you can use scrubs 2-3 times per week. Why? Because young skin makes new, plump skin cells as fast as the old ones get sloughed off. It’s the reasons why young people have such amazing smooth, soft skin (even if they have breakouts). As you age, exfoliate only once a week. The whole process of making new skin cells slows down and the dead skin doesn’t get sloughed off as quickly or as evenly. If you are over the age of 65, exfoliate once every two weeks. Too much exfoliation will cause your skin to dry out and thin faster. 3. What is Needed in DIY Sugar Scrubs? 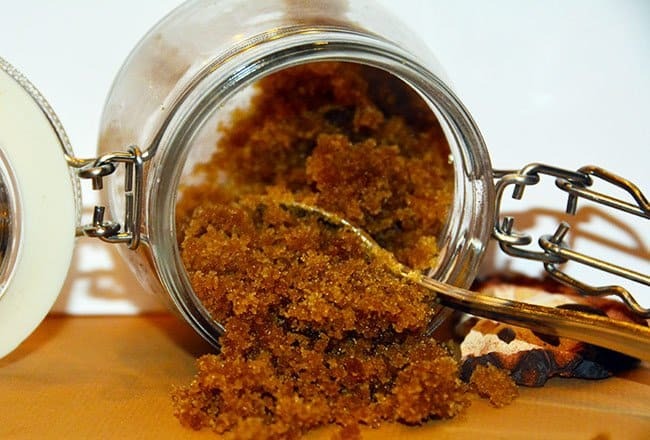 Scrubs require two main ingredients: an exfoliant such as sugar, salt, oats or cornmeal. And something to bind these ingredients such as coconut, apricot, almond, grapeseed or olive oils. You can also use honey, yogurt, or buttermilk, but your scrub would need to be kept in the refrigerator (I prefer using these ingredients in facial masks). I also like to add essential oils, fibers or powders for color, fragrance, and texture because of their benefits to the skin. 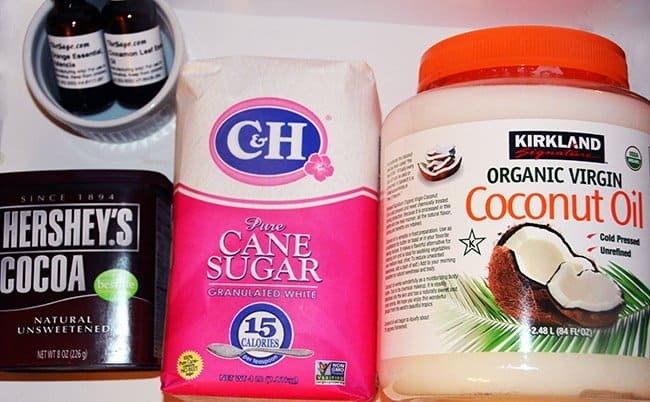 The ingredients you need for DIY Sugar Scrubs are simple: white sugar, or organic sugar, some kind of oil like coconut oil or grapeseed, almond, apricot or olive oils. Adding an essential oil or fragrance oil makes the scrub smell heavenly. There are many benefits to sugar scrubs! When making your own scrubs, you can use natural and fresh ingredients and eliminate the unnecessary chemicals found in commercial scrubs. And, you’ll save money. Most ingredients used in scrubs are things you have in your fridge or cupboard. When using essential oils you can use oils from Young Living or from dōTERRA®. If you prefer essential oils that are less expensive, try Starwest Botanicals, Mountain Rose Herbs or Atlantic Spice Company. Even using scrubs weekly, it’s imperative that your skincare regime includes a healthy diet of fruits, veggies, and water. Also, watching your sugar consumption will help immensely because too much sugar will cause your skin to age quicker. Sugar is fine to exfoliate with—just not to consume. 6. Throw a DIY Sugar Scrub Party! Organize a “Sugar Scrub” party for friends, family, and neighbors. These recipes are simple to follow and luscious to use. Encourage your tweens, teens, and grandkids to experiment with the recipes. Creativity and imagination are born from experimentation. To keep the scrubs simple, I did not include oats. However, they work great as an exfoliate and are powerful for radiant skin. Why? Oats contain proteins called saponins and they help to dissolve oil on your skin and loosen dirt from your pores. If you use oats in any of these recipes, grind them into a flour in your blender. Don’t put whole oats into a scrub—they fall off the face and body and create a mess. And don’t use instant oats—they don’t mix well with wet ingredients. releases the saponins for the maximum benefit for your skin. In the Halloween scrub, I use cocoa powder. Believe it or not, chocolate actually benefits the skin! The flavonoids in chocolate help to filter out UV rays and it’s high in antioxidants which destroy free radicals associated with aging. It’s also an excellent source of vitamins A, C and D. Vitamin A has cancer-fighting properties; heals damaged skin and reduces the appearance of wrinkles. Vitamin C increases collagen production in the skin. Vitamin D creates healthy skin cells and improves skin tone. Chocolate is a natural anti-inflammatory and very gentle on the skin. It can soothe irritation and it’s suitable for people with very sensitive skin. In the Christmas scrub, I use a cranberry fiber made from fresh cranberries. Cranberries contain ellagic acid that helps to prevent wrinkles and premature aging. They also block the formation of MMPs (Matrix Metalloproteinases). MMPs are enzymes that are activated when you get too much sun exposure or inflammation. They are not good because they break down collagen and elastin. You want them blocked and cranberries will block them. I use dried cranberries in the Christmas scrub. 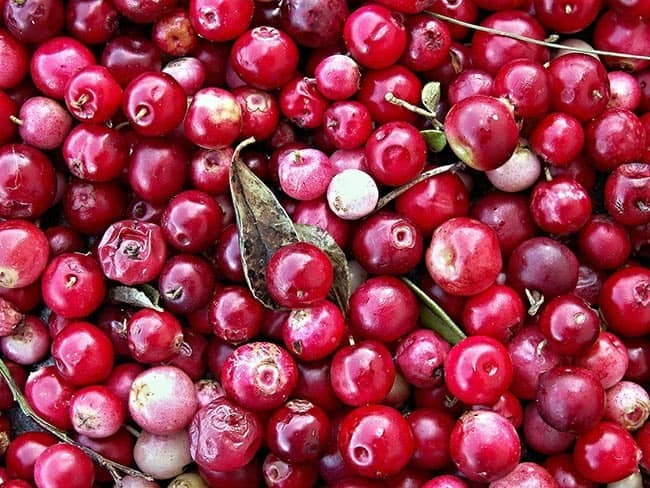 Cranberries are amazing for the skin–full of vitamin C which stimulates collagen in the skin. Plus it gives the scrub a beautiful red color! Grapeseed oil will leave a soft “film” on your skin. If you don’t like that feeling, rinse off with soap. Coconut oil, like olive oil, contains fatty acids that will replenish your skin’s natural protective barrier without irritating the skin or causing a rash. Coconut oil prevents wrinkles, sagging skin, and age spots. For these recipes, use food-grade coconut oil–not cosmetic grade. Although I usually use dead sea salts in my bath salt recipes, on occasion I add a bit to some of my body scrubs (not facial scrubs). Dead sea salts can promote healing of skin tissue and is essential for cell metabolism. When using a scrub—be gentle. You don’t want to end up with red or irritated skin. Pay attention to the “Options and Substitution” section. They are great ideas for your kids to experiment with. Use body scrubs in the shower—if you’re concerned about something going down the drain—use a drain trap. I’ve taken my favorite ingredients and created these yummy holiday scrubs. They make great gifts for friends, family, neighbors or teachers. Your teens, tweens or grandkids will love making these for their friends, too. NOTE: Usually when I make a scrub, it’s a 2:1 ratio of sugar to oil. However, when adding powders or oats, they absorb more liquid so the amount of fatty oils may need to be increased. If you live in high elevations–you will need more oil as well. All of the recipes make about one batch of scrub. The combination of chocolate, orange, and cinnamon in this scrub is luscious. And, it smells good enough to eat! 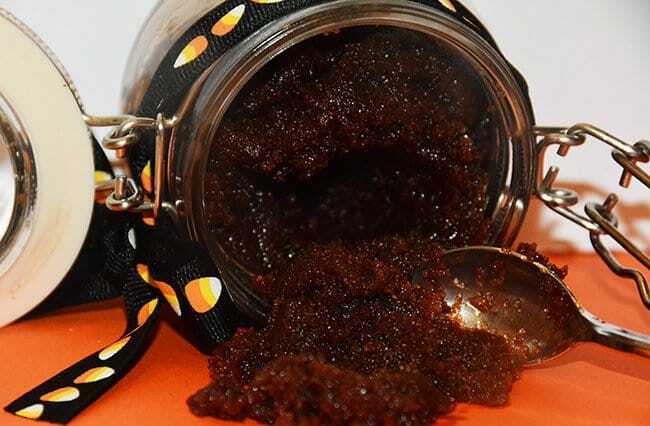 This Halloween Chocolate Orange Cinnamon Sugar Scrub is the best! It smells amazing and chocolate has many amazing benefits for the skin. You can whip this up quickly–and most ingredients will be in your cupboard. The deep chocolate color makes this the perfect Halloween gift! Can be covered and stored in the refrigerator. To use: you may have to add a bit more coconut oil if the scrub seems dry from being in the refrigerator. Gently scrub over your body while in the shower. The chocolate scrub was decadence! The smell was AMAZING! I would use it a shower, though and not in a bath. It left a funky chocolate glaze over my body, but the shower would have rinsed all the unwanted off and kept all the yummy smells on! Looking for a fun and easy Thanksgiving gift for family and friends? This is a luscious apple, vanilla and orange sugar scrub that brings out the best of the season. It is made with brown sugar and grapeseed oil and will make your skin feel soft and supple. Plus–it’s easy-peasy to make! To use: you may have to add a bit more grapeseed oil if the scrub seems dry from being in the refrigerator. I’ve known about sugar scrubs for years, but most are too oily and messy. I was given this scrub as a gift and to my surprise, I loved it! I enjoy taking long hot baths, but they leave my skin feeling dry and itchy. I took the sugar scrub with me to the tub and tried it from my face to my toes. The consistency was of moist sugar, not sugar drenched in oil. The scent was a spicy brown sugar and the scrub both exfoliated and moisturized my skin. It was wonderful! I plan on making these with my daughters during the holidays. Highly recommend! The smell, the feel, and texture of this scrub are amazing plus the Christmas red is perfect for the season. This is one of my favorite scrubs! It’s a gorgeous deep red (like pomegranates and cranberries) and makes your skin feel silky smooth. It’s the perfect DIY Sugar Scrub for Christmas and will be the perfect holiday gift for friends, families, neighbors or teachers! I was expecting another “cute” scrub that smelled good, but this scrub went beyond my expectations. It smelled good AND left my skin soft and moisturized which lasted for more than a few hours…more like a few days! I was pleasantly surprised to like it as much as I did (most homemade scrubs I’ve tried are not that impressive). My daughters and I are planning to make these for Christmas gifts this year. 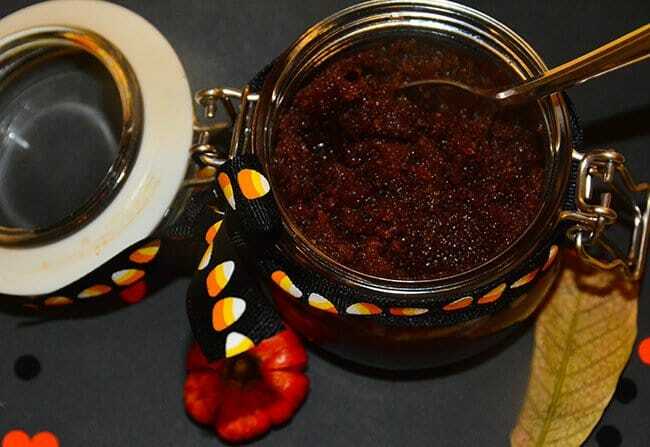 If you want the recipe to the Pomegranate Body Scrub with Cranberry Fiber, you can access it on my Protected Resource Library. Please fill out the form below with your email and I will send you the password. If I already have your email, open your email and the password is included. This recipe is just one of many items included in the Resource Library. 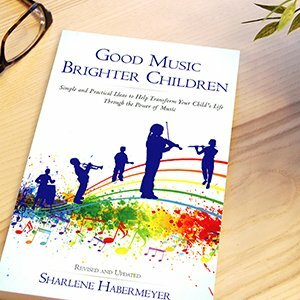 You’ll also find lists of books for kids (all ages and stages), recommendations of toys and games that build the brain, nutrition tips for kids, music CD lists (music lists for when your kids’ study), recipes, free printables and more. Trust me, you’ll want access to this section if for nothing else but to have this recipe–it’s that amazing! Think up clever ways to package your scrubs—jars, bottles or other fun containers. When I give these as a gift, I like to put several things into a basket: the scrub, herbal teas, candles, a rejuvenating gel mask, loofah sponge, and of course a fun label giving directions on how to use. 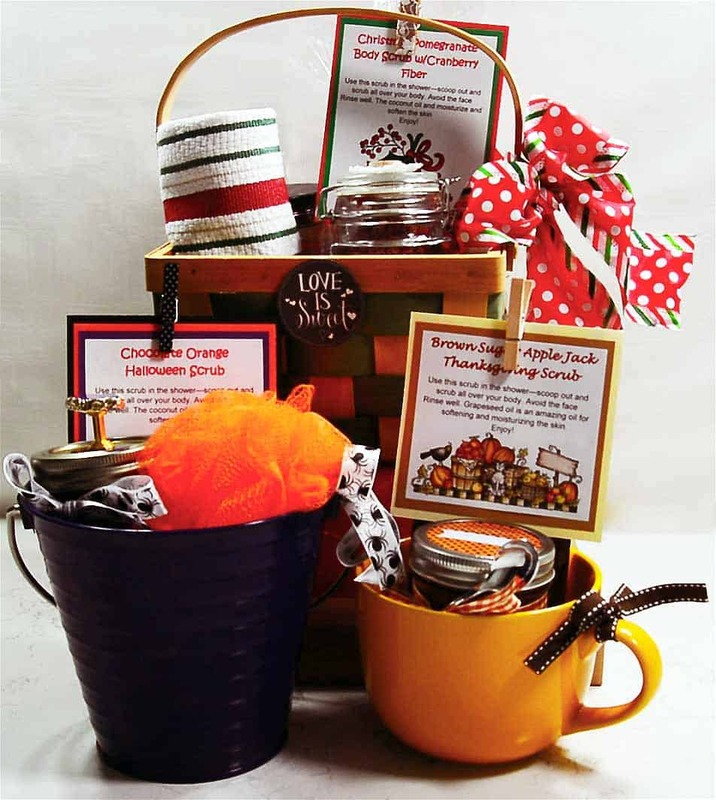 You can give the scrub by itself in a clever container, or you can make the gift more like a “spa” gift–complete with teas, mugs, candles, loofah sponges, and other things for a fun pampering activity! What scrubs have you made? Are they seasonal or can they be used year-round? Please share your ideas and comments in the section below. Want to remember this? 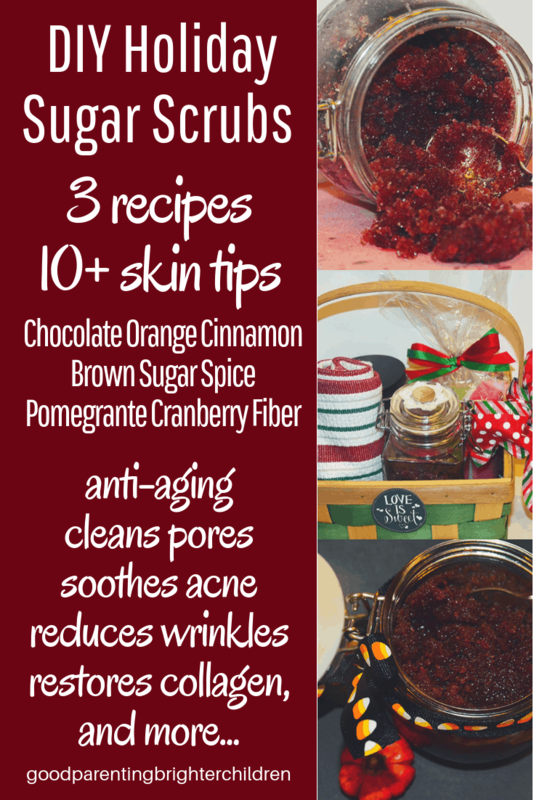 Post these Holiday DIY Sugar Scrubs recipes to your favorite Pinterest board! « How to Make the Best Stovetop Potpourri With Your Kids! These are fabulous gift ideas!!! Thank you for sharing, can’t wait to try some of these out! Thanks, Thena–they are amazing and extremely easy to make! Thanks, Tiffany! I was thinking of doing the same thing this year–a DIY Sugar Scrub party! But, these are easy and quick to make so I think making something else along with it would be fun, too. i”m glad you like the videos– I actually like the Pomegranate Cranberry video the best–it’s in the Protected Resource Library– you should have the password. Thanks for your support! What a fabulous post idea, Sharlene! I’ve yet to make my own DIY scrub and have always wanted to try it. I like the idea of throwing a party and doing it together with some friends. Each year I throw a Pinterest Party where we make a craft and I think this would work perfectly for it. Sounds like a ton of fun in my opinion! I very much appreciate the videos you’ve put together to go along with this post, as well. They’re perfect for my visual mind! Thanks again for a wonderful post.